How best to use new technologies to support our primary students is an issue we are wrestling with in our district. As teachers and schools experiment, some thoughtful and innovative practices are developing. One that is worth highlighting comes out of Irwin Park Elementary School. They have taken home reading and moved it into the digital age. What I really like about the initiative is that it doesn’t simply replicate what has been done in the paper-based world on computers, but allows collaboration in a way not possible without the technology. The program comes from the primary classes of Maria Yioldassis and Leslie Dawes and has been supported by the school and by our District Principal of Technology and Innovation, Gary Kern. This project exposes students to digital text and introduces them to reading online in a school context. It also allows students to collaborate and share their experiences with other students. 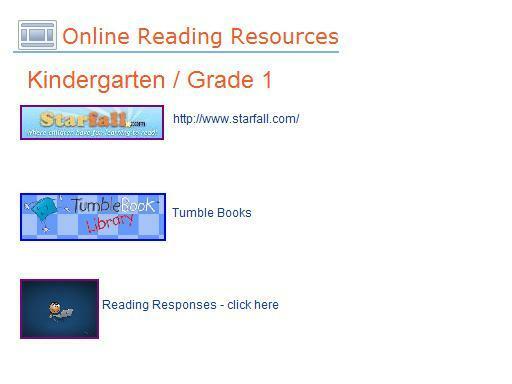 The teachers have students read digital texts they find on two popular sites, Starfall and Tumblebooks. Both sites provide text at various reading levels and accompanying visuals. 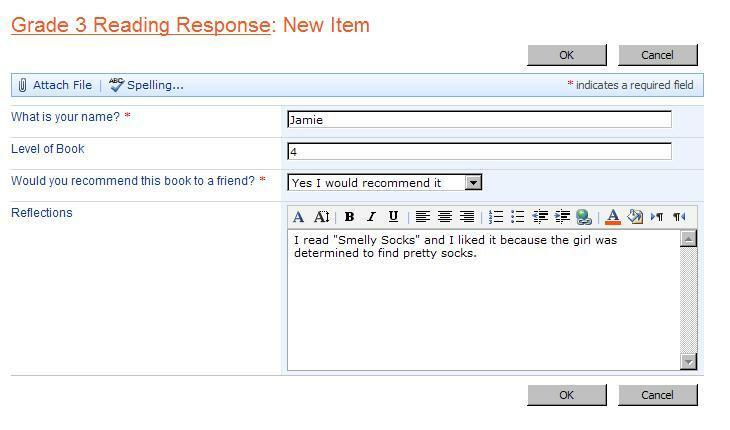 Once students finish reading the books, they make brief comments on what they read, a process that can first be done in class, and then be repeated at home (see screen shots below). Some of the findings from this initiative include students having become self-confident in navigating through their e-books, choosing an appropriate book, reading the book, and then sharing what they have read through the website. This process has been replicated at home and also during choice time within the classroom. Teachers have also reported an increase in student confidence with online material; an increased awareness of what others are reading, and an overall sharing and appreciation of books read. This very simple idea is spreading in West Vancouver. This fall, professional development days focussed on digital literacy; a number of teachers throughout the district have become comfortable with creating similar class spaces for their home reading programs. Many who are very interested in using this technology in their classes see this as a wonderful entry point – it is not an add-on as home reading is already going on. In addition, it allows parents to participate; it gives students greater ownership of their own learning, and it models the collaborative skills we want to build in students throughout their schooling. What we are finding is the entry point for most teachers with a digital presence is as a one-way communication: informing parents and students of upcoming calendar items, class news and homework. What is exciting about this Home Reading program, something we are calling a “next practice,” is how it engages students and families with the technology. There is still a lot to explore, particularly with our youngest learners and how best to use technology to support their learning, but projects like this one are very exciting. I will have quite a bit to say about the entire TEDxUBC experience but I wanted to share my slides and text from my talk today. Thanks to everyone involved for such an amazing experience. Thanks to Gary Kern, Andrea Wilson and Deb Podurgiel for your assistance and the entire Students Live team for all the inspiration. It is a real pleasure to be here. There is a lot of excitement and anticipation in our province right now regarding education and future possibilities. Often, when I speak, I show provocative videos, talk about the changes we are making and need to make – today is something different. I am going to share a story today that helps illustrate what I think 21st century learning, or personalized learning, could look like. A story not about what we could do, or should do, but what we did do. The Vancouver 2010 Winter Olympic and Paralympic Games were an amazing experience in our city, province and country. With the Games coming to our city, many in education worried the Games would come through our city and it would be a missed opportunity to engage our students. Along with my colleagues, Audrey Hobbs-Johnston and Gary Kern, and with the support of Christina Adams and the Vancouver Olympic Committee, we created Students Live! Students Live! was the opportunity for 25 students to be student reporters for the Olympics and Paralympics. Describing the program as a student reporter program does not do justice to what it really was for the students, and for the adults it was an absolutely transformational experience. It was starting with a blank slate and creating from that. So, it was an absolutely amazing experience. The students attended events on an almost daily basis, participated side-by-side with international journalists, and experienced the Games in a way that was the envy of all their friends. And this was all great. What we learned were lessons that transcended a sporting event, or a moment in time. It started with a competition to select the students. This is not surprising, but as students opted in, there was much greater buy-in. We know when we have an application on a course, the numbers interested usually increases. Students were asked to write a blog post, create a photo journal, or otherwise use web 2.0 to show how and why they would be good reporters for the Olympics. For most of the close to 80 applicants – this was a new experience. While we often talk about how well-versed students are in technology, in this activity, which targeted those with the greatest technology skills – the act of writing a blog, or otherwise creating digital content for a public audience – was largely new. What we saw in selecting students, and throughout the entire process, was that good writing and strong communication skills still matter. The tools have changed, but the best writers who captured the biggest audiences, and quickly built huge followings, were those who could communicate, while the weaker writers – no matter how adept they were with the technology struggled. Much is made of technology, and how our text messaging generation sees writing as less important – I actually have never been part of something where it was so evident how important good writing is. The first day we met with the students we focused on the social media we would use and how we would engage the community with it. A quick survey of the room showed every student had Facebook, with little evidence of any other tool; some had YouTube and Twitter, but not much else. It also became clear that while the students were quite good with technology, they had absolutely no idea how they could leverage technology to build an audience. While students had friends and connections, they didn’t have the first clue on how to turn these friends into an audience, and then how to grow their audience into influence – they had never contemplated using the tools in this way. This is key – while the students may have been native to technology, many had no idea on how to really use it to build community. Of course, we created what was then called a “Fan Page” – so, this was mid-day on a school day and we challenged them to get 1000 followers. They were able to do this within hours – all during a school day – you want to believe students are not really on Facebook during the school day. What the students learned, was how they could get Facebook to work for them – when combined with Twitter and their blog, they had a megaphone to their network. About face-to-face meetings – we could never have done what we did virtually, if we had not first built community face-to-face. I am more convinced now than ever, online is absolutely best among people who have the context of face-to-face relationships. First, it was like an “Ah-ha” moment – mobile technology was a game changer. Those with smartphones had a huge advantage. They could take photos, post to Twitter and Facebook, and just simply connect in real time. The less ability students had to perform all of these functions in the moment, the more they were challenged. And yes, it was reporting, so real time was really key to the project, but what we saw was more than that. Amazingly evident was just how key it was to be able to publish live. Students who had to wait to find wireless internet access fell behind. The other key was video. The best writers stood out, and photos were great – but those blogs building community all included video. What a great lesson for the classroom and the need to build video into our work. It was also clear students loved to look at each other’s work – not in the “mine is better than yours” way – but “yours can help make mine better”. It was amazingly non-competitive, but students commented afterwards the biggest impact on improving the quality of their work, was their ability to see other students – other models of what could be done. Everyone commented their work improved because 1) it was public and 2) they could read and learn from each other. The students also loved publishing for a public audience – they had never really contemplated audience before. What they knew was about was writing for a teacher – now they were writing for an audience, and the better they wrote, and the more interesting their topic, the larger the audience. There were students who had up to 100 comments on a blog post. They combined excellent writing, with leveraging their network, and with a savvy use of social media. In our debrief, students said it was actually frustrating going back to school because they had seen what was possible with real-world learning, publishing for a public audience, building community and they had to return to what school has always been – it felt less relevant than ever. While it is true the Olympic Games were a unique experience, and it will be difficult to duplicate the experience with less exciting events, the lessons transcend the Games – mobile technology can change learning, good writing still matters, using social media needs to be taught and should not be assumed, networks are essential, and once students get the taste of the real world, it is addictive and they will want to go forward, not back. The entire experience was also profound for the adults involved. For all of us, the experience felt more like what we have often thought of as a team, and less as a class. Maybe it was because we didn’t have rows of desks, and because we asked more questions than giving answers, or because when the students were stuck we asked one of them to be the project leader and to get a team to solve the problem. It absolutely felt like learning, and it felt like everything we hoped school could and should be – but often it didn’t feel like class – it felt like we were in the flow. It was reinforced students will build their own networks. Sure, we guide them, support them and stand beside them – but they can build their own networks. They can get 1000 members in a Facebook Group and then figure out how to turn these members into a network, and they can ask “the real world” to assist them, instead of just playing in a simulated world in schools. I was exhausted! Just because I was not at the front-of-the-room teaching did not mean that it was easy; teaching is still hard. Sometimes as a large group, sometimes as a small group, sometimes one-on-one, all hours of the day and night – we were learning and working together. It was a fundamental change of the role of teacher and student. We were their supports, their adult mentors – but didn’t have the answers. The students found teachers in this project, not blocked out as in a schedule, were more important and necessary. Adults are amazing. There is a world full of adults who want to help students in all professions, just waiting to be asked. In reflecting on this, I was reminded of the recent TED Talks by Sugata Mitra, who spoke of the network of grannies waiting to assist. Right now, we have only really engaged a small number of students through work experience in this real-world mentorship, but have found in this project every adult asked was willing to help. Yes, it was the Olympics – but there is an untapped resource waiting for us to engage them. Finally – the adults were reminded that we need to trust the process. We always want to jump in and solve problems – we are good at that. Sometimes you need to let students work through situations, skin their knee and be there beside them to offer support. Working with the other teachers and the 25 students was the greatest teaching experience of my life. I saw what I wanted for my kids, and for all kids – real-world learning that takes advantage of the latest in technology – but is not about the technology at all. In the end, what the students liked the most was they had the permission to play. Actually, this is also what the adults liked to – we would often ask, “Can we do this?” – like we have been trained to always find a way and a reason not to try, not to experiment. We all also loved the freedom, choice and responsibility. While students and adults spent much of our time in the virtual world during the project, these bonds have flowed over into the face-to-face world – and we are all still connected. We are on the verge of big changes in education; we need to listen to the voices of the students, rethink the roles of teachers, and build systems that create powerful real-world learning opportunities. Professional development is often a mystery for those outside of education. Today is a province-wide professional development day, often referred to as the PSA Day – as many teachers attend their Provincial Specialist Associations conferences. Here is a list of some of the many opportunities. The day is for more than just the teachers in our system. My day today is working with all of our Administrative Assistants, Teaching Assistants, Special Education Assistants and others who collectively are part of the West Vancouver Municipal Employees Association in West Vancouver. And just what is topical with these employees? The common thread of almost all the sessions is technology. Sessions will focus on Kurzweil, our inside45 portal, Report Central, BCeSIS, and tips and tricks with Office, including Word, Excel and Publisher. I have the opportunity to present an opening keynote, Going Where the Kids Are – At Work and Home (click on the title to open the wiki presentation). It is a combination of several talks I have given over the last couple of years on the amazing changes in our personal lives, and how our school system is beginning to embrace these technologies that are so pervasive outside of school. It should be an excellent day. Do We Really Get to Drink the Coffee? I just finished spending the day with about 220 students, and 60 adults, representing several dozen schools from across the Metro Vancouver area (including all three secondary schools in West Vancouver). It was the latest installment in our School Completion and Beyond Series. The program, initiated by a Ministry of Education grant to the BC School Superintendents’ Association, focuses on improving the quality of students’ high school experience. The basic premise is schools work on a project, or inquiry question led by students, intended to influence the structures or behaviours in their school. Schools and districts meet twice during the year, to be re-energized and track the progress of their work. They also share and learn from each other – something the students love! Today’s work was framed by John Abbott, who is quite popular right now in B.C. with current conversations swirling around personalized learning. John spoke to the students (including a history lesson on Peter Puget), as well as during the morning table discussions. Why Are We Here Anyway? What has been particularly assuring about the sessions is the work has been sustained over several years, and now continues with younger students joining on as older students take on greater leadership. For the first time in the three years of the series, students did all of the organizing and logistics planning today – truly owning the process. The key request from student organizers asked of adults today – dress like us, no suits, no ties, be part of the group. As for the title of the blog post, it comes from a question I was asked this morning. Students seemed surprised and impressed that the coffee and muffins were not just for the adults – they were partners today – and could drink the coffee. It was exactly one year ago today I found out that I would be the next Superintendent of Schools for the West Vancouver School District, a position I will assume this coming January. While some have heard me tell the story at various events, I wanted to share how I used Twitter to assist me in the process. On the day of my interview, one hour in-advance of its scheduled start, I was given a question. This is standard fare for many interviews. It is a process I had experienced twice before. I was to take the hour to pull together my thoughts and formulate a presentation I would then share in the first 10 minutes of the one-hour interview. Time #1 – 2001 – I was given the question, a pen, and some paper. I madly scribbled my thoughts. I used a highlighter to remind myself of the key points. Like doing a timed essay from university, I rushed until the final bell, and emerged to present everything I had pulled from my brain over that hour in those 10 minutes. Time #2 – 2007 – A very similar process, but this time I was set up at a computer. I took the question and digitized the process I had done six years earlier. I performed an almost identical process except I did it in PowerPoint. Instead of emerging with highlighted notes, I had organized slides. Last October, my interview for the Superintendent position, was different. As soon as I received the question, the first thing I did was re-post the question to Twitter. Only two years previous, I would have probably considered what I was doing as cheating. I was sharing the question with many of the smartest, most thoughtful people I knew, both locally in West Vancouver, but throughout Canada, as well as around the world. And over the next hour, 12 people in my 500- (or so) person, Twitter network responded. There were a few quotes, some links to helpful research on the internet and a couple of “good luck” wishes. I took their thinking, blended it with my own, and put together a presentation. I concluded that the Board was not as interested in what I thought, as they were in that I could find the best thinking, synthesize these ideas, contextualize them for our location, and share them in a thoughtful way – all in a timely matter. My 10 minutes was not about what I knew – it was about the best thinking of my network, personalized for our very unique and specific context. Networks matter. Of course, nobody had any responsibility to share, but they did. Sharing, and sharing online specifically, is not in addition to the work of being an educator. It is the work. I still haven’t come to terms with what exactly the power of our networks mean for concepts like “cheating” – I am sure there are some who might view what I did as dishonest. I like to think it offers insight into what personalized learning could look like and how doing the same old assignments, the same old way, is not good enough. In the year since my interview, I have only become more reliant on my network – in all its forms – both in the face-to-face and digital worlds. What I saw as a risk a year ago would be an automatic decision now if I was placed in a similar circumstance. I am part of a sharing revolution. Here again is Dean Shareski’s keynote presentation – 25 minutes well spent! With all the discussions swirling around personalized learning, and school reform, I have been thinking a lot about change, and how we do it right. Model the change. Demonstrate the way you want things to change through your own language and behaviour. Often, seeing a leader do something first gives people the courage to try it themselves. Turn negatives into positives. Find ways to reframe people’s resistance as opportunities for change. This requires that you listen carefully, understand the underlying reasons for the opposition, and address them directly. Find allies. Chances are someone else in the organization wants the change as badly as you do. Find that person and pool your resources and ideas. This fall, I have been amazed and impressed with the energy in our district around personalized learning and how teachers are using technology to support it in their classrooms. While it has taken many forms, and actually very few use the term “personalized learning” and opt instead for differentiated instruction, grouping for learning, inquiry-based learning, among a host of other terms, we have profound examples of teachers feeling they have “permission” to experiment and be creative, and students owning their learning in new ways. Of course, this is not a race. Earlier this week, we spent some time with all our principals and vice-principals looking at our successes and challenges during the first month, as well as what we want to do during the next 90 days, with personalized learning and using technology. One theme constantly emerged: the need to continue to focus on learning goals and then, if appropriate, see how technology can support them. We also discussed the opportunities and challenges of students publishing for a public audience, and how we work with students and parents as we do this in an authentic and secure way. The discussions we are having may be about schedules, content or technology, but almost all of them come back to being about change – schooling looking different for students than it did for their parents; schooling looking different for staff than it did when they were students. Our commitment for the next 90 days is around providing more support to teachers around pedagogy and technology, to build greater capacity at each school, and to continue to invite participation from students, staff and parents on this journey. We all agree that education is changing, and there are some amazing examples in our district of what is possible, right now. There is not one right answer, and to finish this where I started, it is not a race. Yesterday, the McCreary Centre Society made a presentation of their findings from their 2008 British Columbia Adolescent Health Survey to our District Healthy Schools Committee. The depth of information found in these reports is amazing, and the findings are very instructive as we work as a community to build better supports for young people. While still very concerning, the general trends are moving in the right direction regarding youth aged 12 – 18 in British Columbia, who reported seriously considering suicide in the past year; although 12% in 2008, this figure is down from 14% in 2003. Suicide is the second leading cause of death (behind vehicle accidents) for youth in this age range. But, this one particular slide on the topic was striking. While students who have been physically or sexually abused reported much higher rates of suicidal ideation, for these students, there is a direct relationship between a lower rate and how connected they feel to school. We often discuss the power one adult can have in a young person’s life, and this data dramatically displays this. While it is often said students spend a very small portion of their lives in school, if they feel connected and build engagement and trust with the adults in their school lives, the positive power can be dramatic. More resources on building resiliency and protective factors are available here on our School District Website.